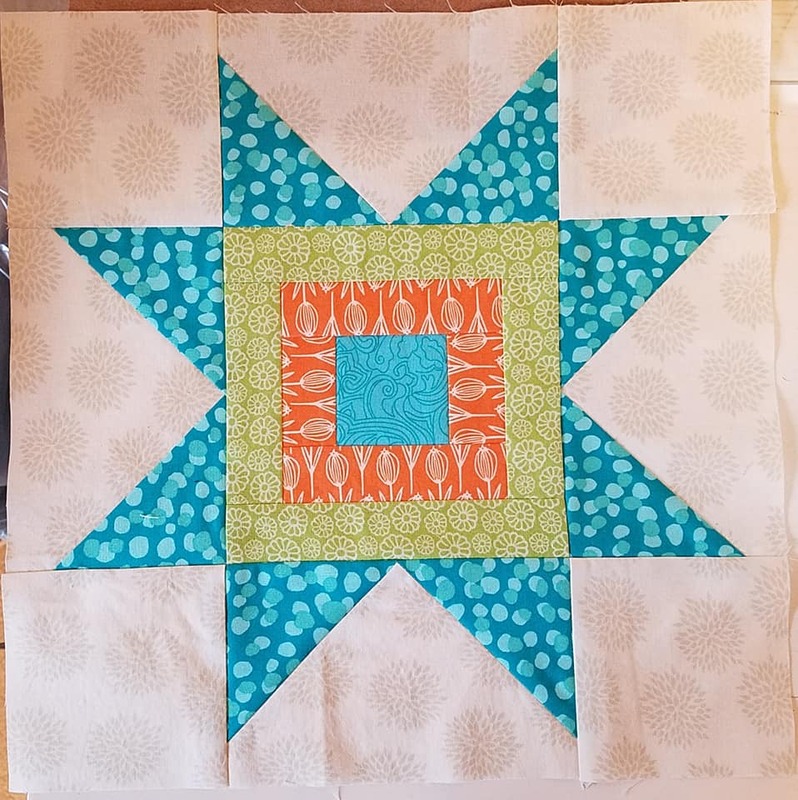 I know I've been teasing about the baby quilts - and the one I've been sewing on in particular - but haven't managed to post any photos. I don't have a photo of the fabric pull (oops! 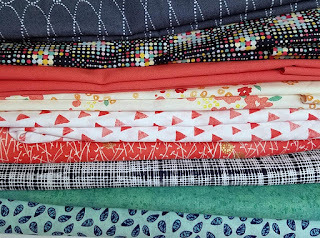 ), but I shopped my stash for fabrics based on my inspiration quilt. 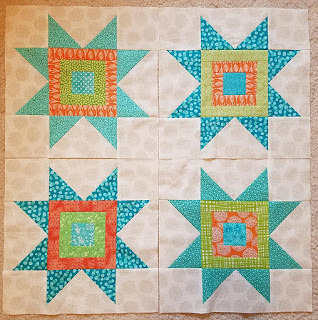 I even found a background fabric that I liked that, eyeballing it, I thought would be enough for 16 blocks. 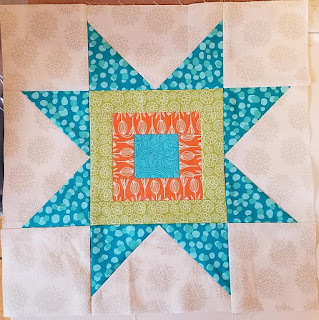 I first cut the background, knowing if I ran short on that, it would be a limiting factor and I'd either have to find more, make the quilt smaller, or get creative with the blocks. (Maybe some with non-white-ish backgrounds and white stars instead?) I had enough background for 12 blocks. And not enough for any stars. But 12 blocks is a good number and I'll go looking for that fabric later. 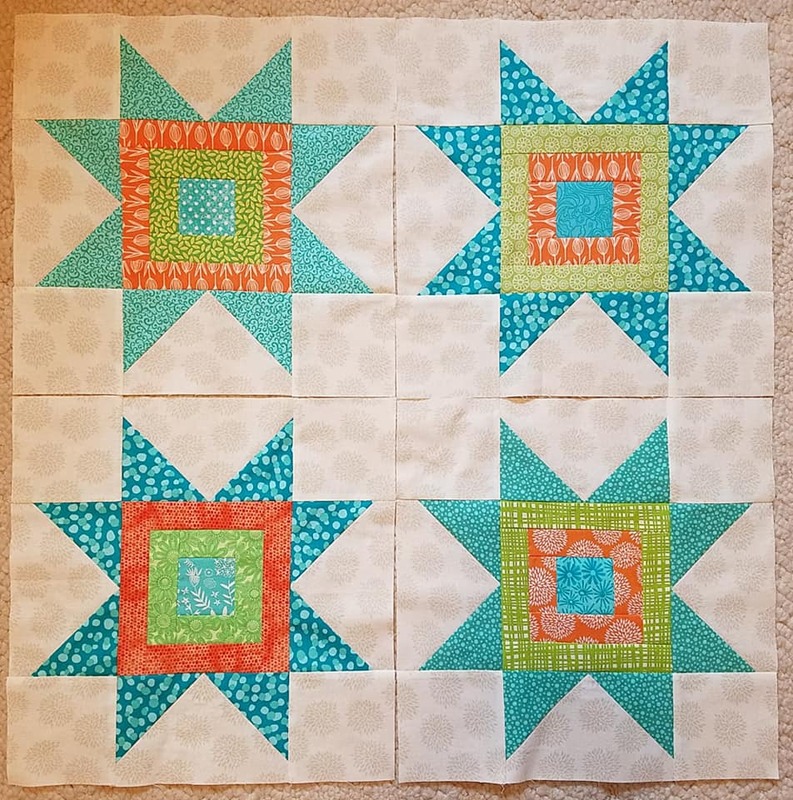 Let's try out the pattern! That came out nicely! 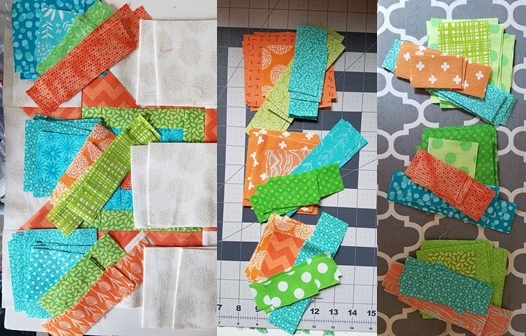 I even used up some of the very last of that orange - 1.5" strips in my stash - that I love so much. 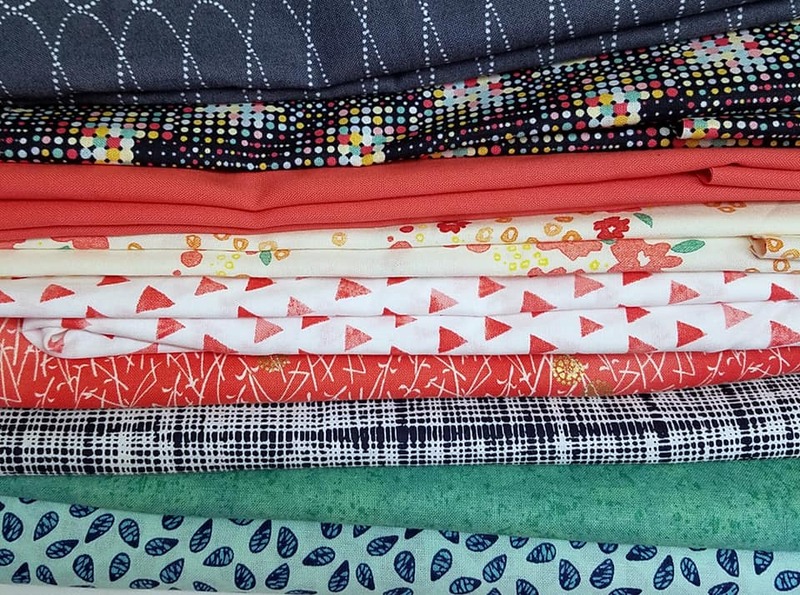 But this gal...she can have all the pretty fabrics. She's that cool. 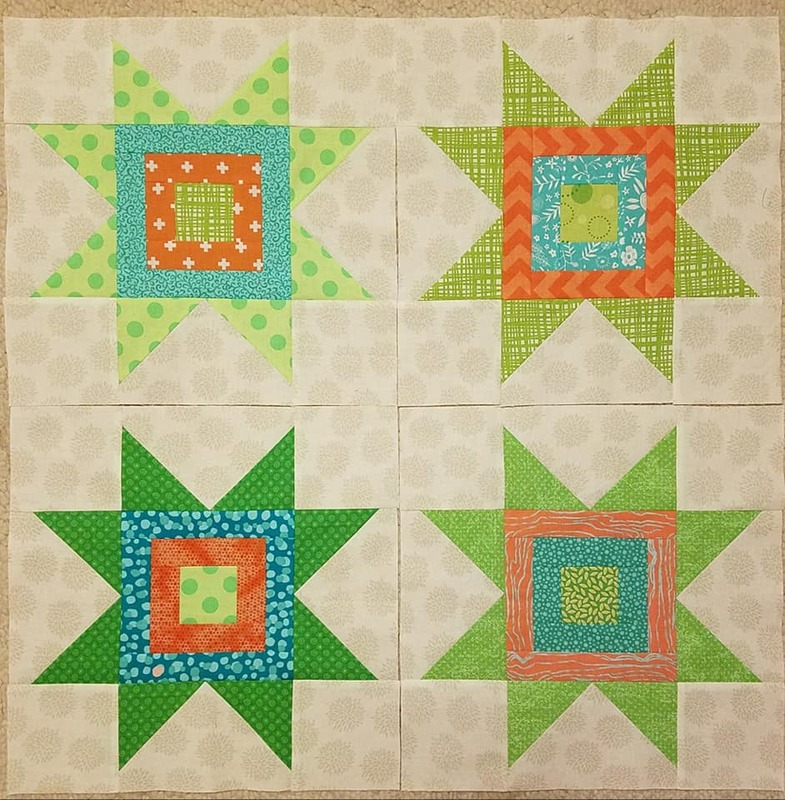 I made a few more individual blocks (no photos), and then knew I needed to make three more in each colorway. Taken at different times of the day, on different surfaces, these don't all exactly look the same, but this was how I kept track of what went with what. Very easy to mix them up, but truthfully, it probably wouldn't have mattered too much. 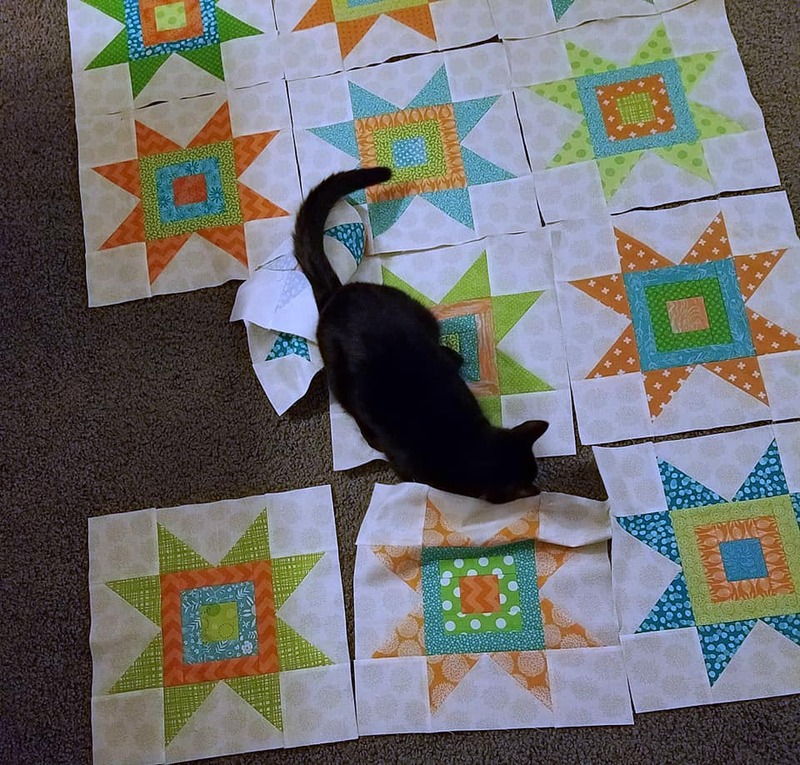 These blocks seemed to take forever. Between cutting all the pieces - one block at a time, no mass-cutting possible here - and then sewing them in a short assembly line, there were a lot of stops and starts. 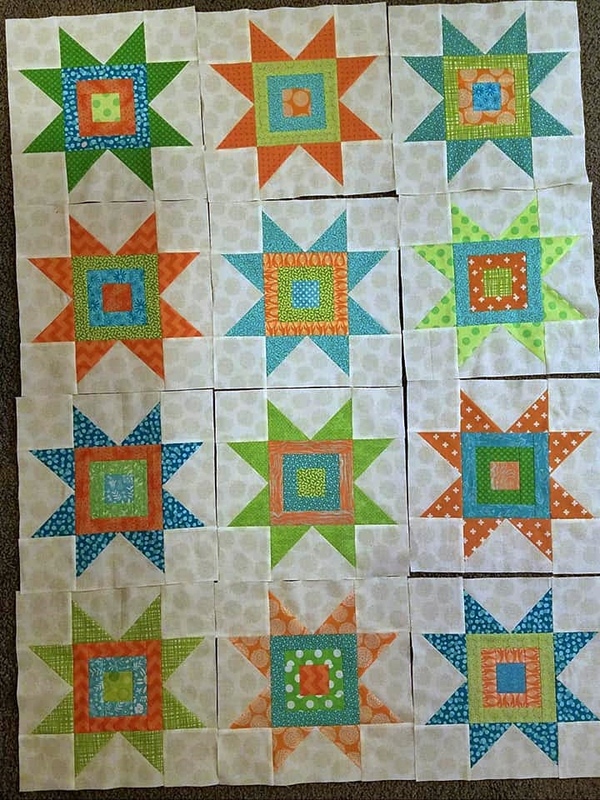 It was also not as easy to cut the pieces, so I procrastinated some. 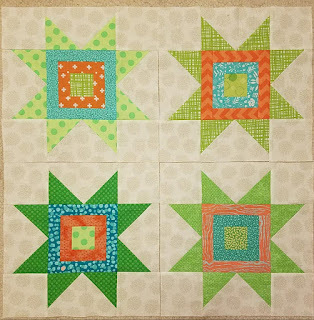 ...and finally Monday night, some green stars! I did go looking for more of the white. I went to three stores. None had it. So I've given up. It was kinda late and the lighting was bad, so these have been computer-edited for color, but are pretty close. It got worse before I got the row markers on and the blocks picked up, but he was even trying to wrestle the pile of blocks after I'd picked them up. He's growing so fast, and not as cuddly as he was as a kitten (definitely learning how to cat better! ), but when he decides to snuggle, he's pretty adept. I have this pair of scissors sitting by my sewing machine. 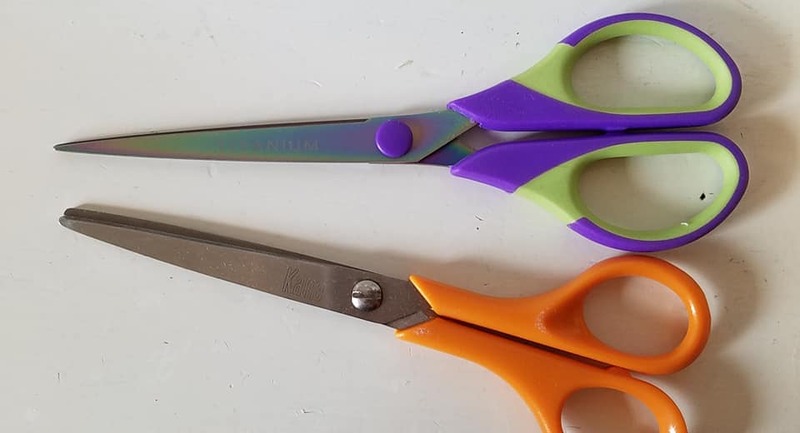 It's about half-size and can be used for paper or to cut tags off clothing (when the hubby walks in and just grabs a scissors)...but it's been a good sharp scissors for years. But I've started noticing it has a few places that catch. It needs sharpening. Or retiring. So I remembered this pair of scissors I recieved at a quilt retreat about four years ago - from the quilt fairy. I thought they were smaller, but they're perfect! Much fancier, so the hubby will need to be trained, but they are so much better! Kinda like changing your rotary cutter blade, you don't realize how bad it is until you get a new one! There's one more in there, hiding, but this was taken quick before the washing machine was started, so they aren't folded neatly yet. 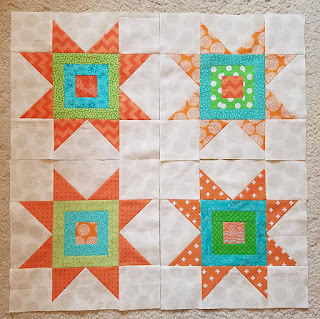 Your blocks all are beautiful, and you were very fortunate to have enough of the background fabric for all of them. I would never have thought of putting those colors together, but it looks great. You got some really nice $5 fabric too! ---"Love"
Just keep that squirrel busy at your house so that he doesn't get bored and decide to wander down to my house! lol I'm really thinking about paying another visit to the $5 yd. fabrics... I don't NEED anything, but you never know. Well, I do NEED, but what I need probably wouldn't be in the $5 'room'. Boy, am I behind reading blog! Love the stars - they look great! Also good to see the cats are doing their jobs. 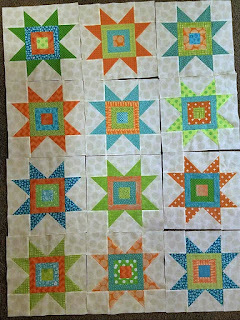 I am loving the colors you are using for your stars, this will be a great baby quilt! It looks fresh and happy! 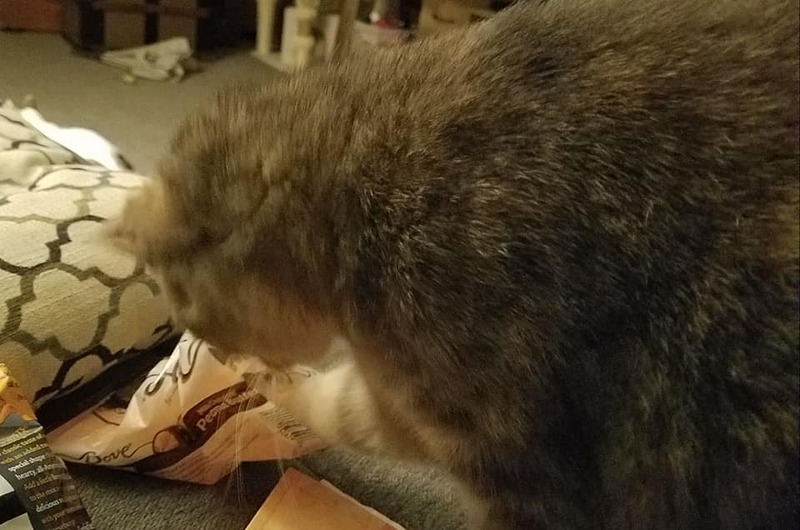 Love the kitty photos, they are great helpers. 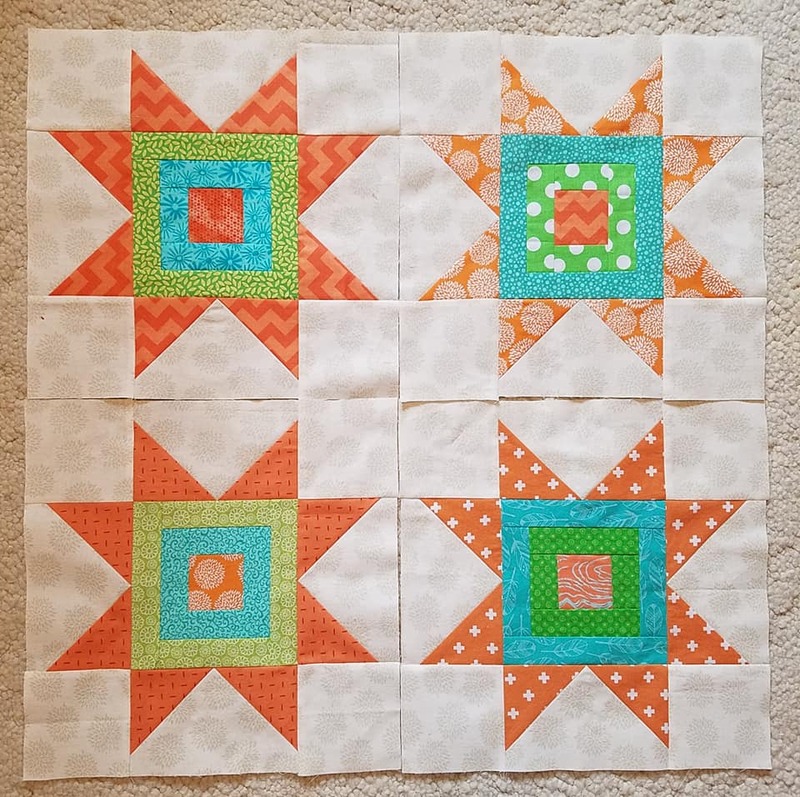 Can't wait to hear about this squirrel, those pesky rodents invade your quilting all the time!